Jouni Järvelä played in UMO Jazz Orchestra for the first time in 1992 when he was 19 years old. He was chosen as a permanent member of the orchestra in 1995 while Rich Shemaria was artistic director. Järvelä’s instruments at UMO are soprano and alto saxophone and Bb clarinet. 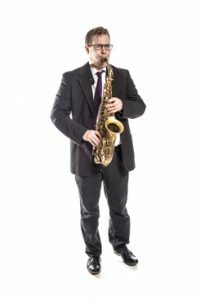 He also masters the C melody and tenor saxophones, Eb clarinet, piano, electric bass guitar and melodica, and owns a violin, flute, harmonica and guitar. Järvelä has been a very visible, trusted and strong soloist at UMO and has also worked for years in UMO’s artistic board. Järvelä’s own line-up, Jouni Järvelä Group, was established in 1996. The distinctive band has released two albums: “Lento” (1999, nominated for the Emma Prize) and “A Grand Day Out (live)” (2005, featuring the Norwegian drummer Audun Kleive). Järvelä has composed most of the band’s music, and composing is generally very important for him. In addition to UMO and his own line-up, Järvelä has played in numerous top orchestras in Finland. The most significant international collaboration partners over the last few years have included the Norwegian drummer Audun Kleive and the American saxophonist, multi-instrumentalist and composer Lenny Pickett, with whom Järvelä has worked a lot. Jouni Järvelä is not only interested in musical expression in almost all its forms but also in cinema, theatre, literature, photography, cooking, dining, history, and the critical reflection on politics. Walking, cross-country skiing, ping pong, badminton, football, and Finnish baseball are also close to his heart. His relationship to Masai shoes, FeelMax trainers and balance boards could be described as passionate – and so could his relationship to playing clarinet, sanding the clarinet and saxophone reeds, and to tautological and endless drivel.